Hot on the heals of the success of the anarchic The Young Ones, Nigel Planer, Rik Mayall and Adrian Edmonson joined forces under the penmanship of Ben Elton for the suitably outrageous Filthy, Rich & Catflap. 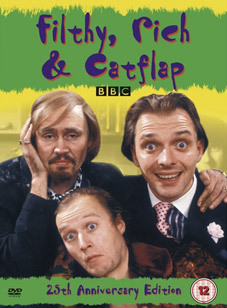 Mayall is the thoroughly self-centred, z-list TV presenter Richie Rich, assisted by his loyal entourage of one Eddie Catflap (Edmonson) and represented by the dour agent and occasional pornographer Ralph Filthy (Planer). Their exploits include appearing on TV-am, engaging with a morally lax Australian press magnate, devising new game show formats, leaving a trail of dead milkmen in their wake and being arrested for shoplifting which all turn out to be the least of their problems. With a stellar list of guest stars including Barbara Windsor, The Nolan Sisters, Anne Diamond and Midge Ure, the show quickly built itself a devoted cult following and can be seen now as the mid-way point between The Young Ones and Bottom. Filthy, Rich & Catflap will be released on UK DVD as a 25th Anniversary Edition on 3rd September 2012 by Acorn Media at the RRP of £19.99.